Happy Thanksgiving from the kids! 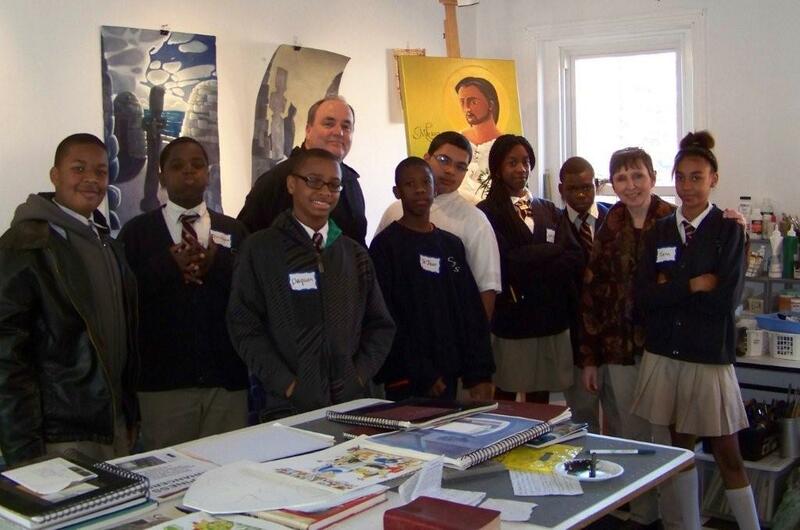 The seventh grade students in Julie Kring-Schreifels art class were recently invited to spend the afternoon in the Camden Waterfront neighborhood to experience the creative endeavors that are taking place around Sacred Heart Church. Local resident and director of The Center for Transformation Andrea Ferich met with students in the community garden and showed off the wood oven they built by hand, as well as the chicken coop, vegetables being harvested and artwork honoring the earth. Following this, they were treated to a visit to the studio of artist Brother Michael O’Neill McGrath. He shared with the students many of his original works inspired by biblical characters in the downstairs gallery, and then works he is currently working on in his upstairs studio. The students were intrigued by his use of symbolism and colorful representation of familiar stories from the bible. They are currently designing their own angels in art class using symbolism to represent a gift they would like to be blessed with. Brother Mickey’s works were the perfect vehicle to help them understand the unique ways an artist can communicate ideas. He likes to quote the great Dorothy Day, founder of The Catholic Worker movement. She said, “The world will be saved by beauty.” Our students were blessed to see some great beauty in their own city through the efforts of people who believe in caring for creation and honoring their gifts. CLICK HERE to view more pictures of the day! It was great to see our Partners return from near and far to engage with our students at CamdenForward School (CFS) Partner Day last Wednesday. Many Partners arrived with arms full of home baked goodies to share with their student and the entire class. Everyone gathered for a program full of wonderful music, a skit performed by the students, a question and answer session with Bruce, all followed by a pizza lunch which was served in the classrooms. After lunch students and Partners worked together on handmade projects, all with the theme of thankfulness. Some of the projects were turkeys, totem poles, and rainbows (our reminder of God’s promise). CFS students were incredible helpers, Interns helped by filling in for Partners who were not able to attend, and teachers orchestrated meaningful relationships and planned fun projects. Joy's attention to detail, special touches, and devotion to the Partner ministry all helped to make the day memorable. CFS loves the Partners - and our Partners felt loved in return! Eighteen students and adults took on the ever challenging Batsto River this past Saturday (November 13, 2010) for a paddling adventure. The New Jersey Pine Barrens, only one hour away from the streets of Camden, offers some incredibly wild and natural paddling experiences on its scenic and tea colored rivers. An Indian Summer weekend with dry air and afternoon temps in the upper 60’s made us all feel pretty lucky to be out in our canoes for the six hour paddle from Quaker Bridge to Batsto Lake. Even though the temps and bright sunshine made you feel warm and excited to be “on” the water I knew that would all change quickly if anyone was to find themselves “in” the water…and it didn’t take long! Only thirty minutes into the paddle Luis and JoMary were fooled by a barely submerged tree trunk. Before they knew what happened they were out of the flipped canoe and into the river. Their classmates responded quickly picking up paddles and floating gear along with JoMary’s floating shoe. The team effort and pre-trip planning paid off as the Trekkers quickly got the canoe to the shore and a chance for Luis and JoMary to change into their dry clothes before continuing on their way. The day was long and challenging but the Trekkers felt proud of their accomplishment. They had taken on the Batsto River in November and successfully negotiated the many twists and turns on a river often not much wider than the length of a canoe. Keep Trekking, the adventure continues. I've had an amazing week! 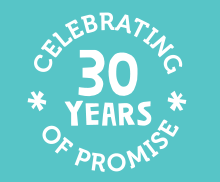 When UrbanPromise Camden started 23 years ago, never did I imagine that this vision would spread to other cities and countries. Never did I imagine that a little summer camp, run out of a church basement in East Camden, would grow to impact the lives of thousands of children and teens around the world. 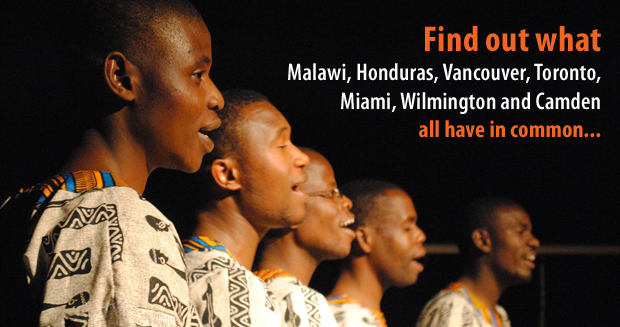 Last Thursday and Friday I listened and watched--in awe--to the testimonies of over 100 staff workers from Vancouver, Toronto, Miami, Wilmington, Camden, Malawi and Honduras. We had gathered for our annual UrbanPromise International Summit--a time to renew our vision, share best practices, deepen friendships, encourage one another while celebrating the miraculous work God is doing through this ministry. "I love coming to Camden," shared a program director from Toronto. "To see where UrbanPromise started and to learn from your years of experience is truly inspiring. I'm going back to my city ready to reengage." From a teacher in Wilmington, "Thank you Camden for your faithfulness and willingness to share your insights with other cities." 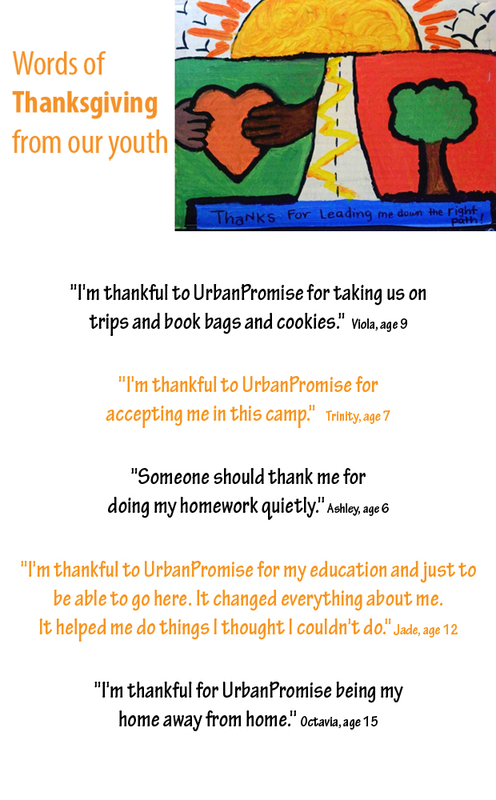 I want you to know when you support the work of UrbanPromise in Camden, you are greatly impacting the work of UrbanPromise world-wide. People look to UrbanPromise in Camden for inspiration, wisdom and guidance. This is where it all started! 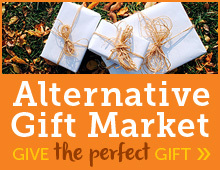 So thanks for helping me keep this movement moving forward! Amazing things are happening. PS. Click here and visit our UrbanPromise International website and read more about our sites around the world. Jean Marshall, from Faith Presbyterian Church in Medford, has been volunteering every Wednesday at Camp Faith for more than 15 years. Recently, she’s been tutoring a boy named Franky. When she heard that he was at risk of failing the 4th grade because of his lack of reading skills, Jean committed to volunteering twice a week to help him. Her many years of faithful service at UrbanPromise is admirable, but she went the extra mile in her commitment to a child from East Camden.